There are tons of great little generators out there to help you write CSS for your Webpop sites. Everything from making a simple gradient to going through your entire stylesheet at adding the current browser prefixes. You can use them to add advanced CSS styles to your site, or just as interactive toys to learn how stuff works. Mother Effing Text Shadow - Interactive text shadow generator by Paul Irish, also check out the Sassy spoof version. All joking aside, you can get a pretty nice effect with the "3d" button. 3D CSS Text - Similar to Mother Effing Text Shadow, but also lets you choose different fonts and has some different controls. 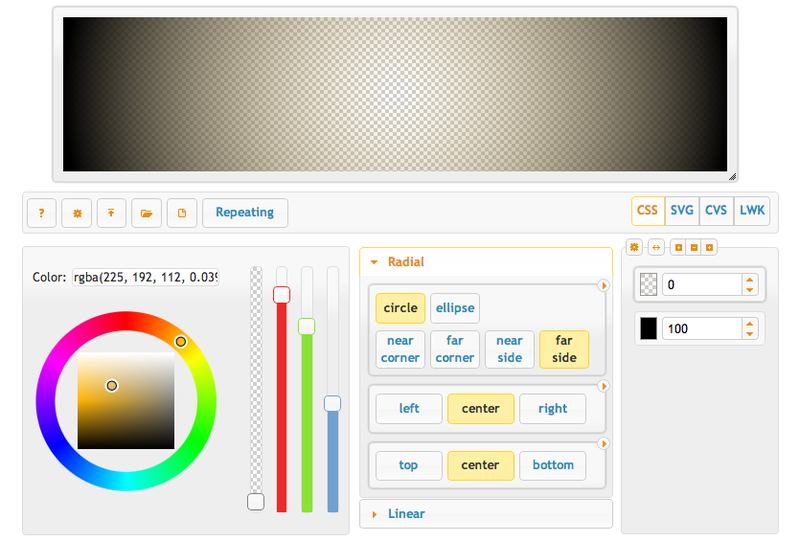 CSSMatic - There are two generators of note here, the Noise Texture and Gradient generators. The gradient generator also outputs Sass. HSL Picker - My favorite color picker, most of the time I use the chrome inspector for picking colors, but this one is nice for fine tuning a color selection and also gives you a good sense for how HSL color works. CSS3Maker - Tons of useful CSS3 effects, but in particular the transitions and animations are handy for quick experimentation and getting cross browser code. SpritePad - This is by far the best sprite map generator I've seen, simply drag and drop your images from your desktop into the browser, and it generates the png and css for you. You can even create an account and persiste your sprites for further edits and collaboration! ButtonMaker - Create CSS3 buttons, complete with hover and active state. WebFontGenerator - Upload a web font in one format, and it will generate the others ( .svg, .ttf, .woff, .eot ) as well as the necessary CSS and a demo HTML file. BorderImage - For when you need that fancy border image. ColorZilla - A full featured gradient generator with Sass + Compass output and the ability to generate gradients from uploaded images. VisualCSSTools - A gradient generator that is great for gradients that simulate realistic lighting. IcoMoon - Nicely done web app for building your own icon font. Icnfnt - Create a custom FontAwesome 3.0.2 icon-font kit with just the icons you want. LayerStyles - Style a layer with CSS3 effects using Photoshop-like controls. Are there any CSS Generators that you love which aren't listed here?